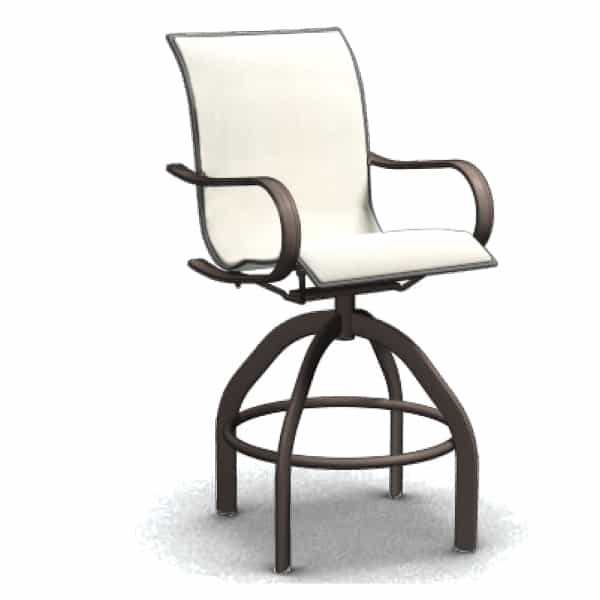 Whether you are searching for the best bar stool to supplement your new outdoor kitchen, or desire a complete bar stool and table set, Homecrest’s Holly Hill Swivel Bar Stool will be a welcome addition to your outdoor life. Holly Hill is simple and elegant and its transitional styling will enhance with any décor, from modern to traditional. The Holly Hill Swivel Bar Stool doesn’t rest on its looks, however; Homecrest has built this bar stool to last. Constructed of durable and sturdy extruded aluminum, the Holly Hill Swivel Bar Stool is rust and weather resistant. The advanced swivel mechanism allows for a smooth glide, making it easy for you and your guests to enter and exit the stool. It is painted with your choice of Homecrest’s fine baked-on powder coat finishes. The sling is a wonder in itself; unlike all other patio furniture manufacturers, Homecrest doubles up on sling fabric; the resulting double sided sling is more comfortable, durable and gives the stool a tailored and finished look. Homecrest has a huge catalog of outdoor fabrics; one is sure to suit your needs.